We're taking a trip chronologically through the Bible this year. Paul calls it like he sees it. 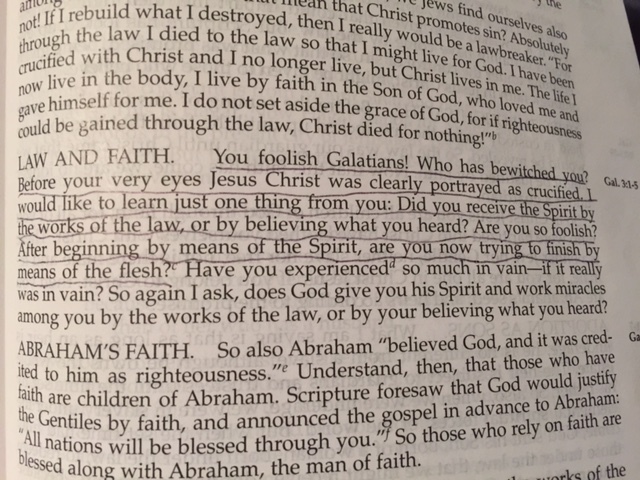 The Galatians were wandering from the truth of the gospel of grace back to acting like their righteousness came from trying to follow all of the laws. They were acting like they could earn salvation by doing good things – the right things. Do we ever get caught up in that lie? Do we ever check off our list of Christian responsibilities and think we’re doing a great job? Pray – well, we say grace at every meal – check! Read my Bible – I really need to find it. I know it’s around somewhere. Here, I’ll sign up for a Daily Devotional email – check! Give money to God – I put $20 in the offering every week – check! Serve – we always bring food in whenever the church asks for it – check! Paul is reminding us today that Christ lives within us. We live by faith in Jesus who gave his life for us. We are all lucky that salvation is not about being good enough – because we will never be good enough. Christ redeemed us from having to complete any checklist. We are all children of God through faith. God has sent his spirit into our hearts, redeeming us, adopting us and setting us free! Nothing we can do will ever make our Father God love us more. Nothing we can do will every make our Father God love us less. Accepting Jesus as our Savior enables us to call God our ‘Abba’ Father. Thanks! Thinking of Christmas as Christ”mas” Christ more me less. Keep pressing on!!! Thanks for the encouragement! You sound just like John the Baptist – He must become more and I must become less. Amen! Hallelujah! Judy Glasser on I Need to Prepare! Huldie on I Need to Prepare! Judy Glasser on What Do I Choose?